Dragon Scroll: Yomigaerishi Maryuu (ドラゴンスクロール 甦りし魔竜, Dragon Scroll: Yomigaerishi Maryuu? lit. 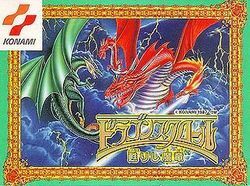 Dragon Scroll: Resurrection of the Demon Dragon) is an adventure game developed by Konami in 1987 for the Famicom. It is often compared to The Legend of Zelda in terms of game play, but it is considerably more difficult due to the lack of clues or information on how to proceed. The game is non-linear, and you must explore different territories in search of the eight stolen magical artifacts that maintain a sleep spell over a large and dangerous dragon. Enemies roam the overworld and dungeons, and must be defeated in order to earn experience points. Experience points are used to increase the player's level, which makes him stronger and gives him access to stronger weapons and magic. Most useful items are well hidden and, even when obtained, are difficult to determine their appropriate use. The game features a password system which allows you to continue play where you left off. The game was never released outside of Japan, or released in any other language. While not crucial to game play, the limited amount of text can somewhat clarify what you are intended to do, or where you should go, but not by much. A fan-made translation patch has been made available by King Mike Translations in 2008, and can be found here. It was an age of magic, in which there existed two factions: Black Mages, who worshipped the three-headed Chrome Dragon, and White Mages, who worshipped the glimmering Gold Dragon. Their conflicts over territory and ideals brought about countless wars. The God Narume knew he must stop the fighting, so he put the Chrome Dragon to sleep in the mountains, and the Gold Dragon to sleep in the desert. He then took magic away from the mages, sealing up the eight Magic Books and hiding them in the sacred desert tower. Hundreds of years passed after Narume erased magic from the world. The people lived in peace, and villages and towns prospered. However, there were also those who would do wrong to gain wealth. Enter the three greedy thieves: Safra, Kakai, and Unasu. One day, as they were being chased down for some evil deed, they became lost in the desert. After walking and walking, they stumbled upon the sacred tower and discovered the hidden Magic Books. Thinking they could sell them for a pretty penny, the three split the books amongst themselves and each went his own way. With the Magic Books gone, the Chrome Dragon awoke from its eternal slumber, determined to plunge the world into a second age of dark sorcery. So Narume infused the Gold Dragon with the spirit of justice, summoning him forth in the form of a hero named 'Feram'. And so, it is up to Feram to collect the Magic Books and return the Chrome Dragon to its slumber. This page was last edited on 23 June 2011, at 21:39.